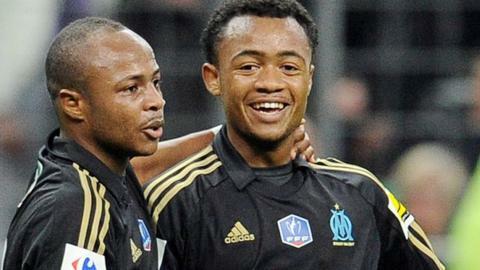 Brothers Andre and Jordan Ayew have quit international football at the ages of 23 and 21 respectively. The duo, who both play for French side Marseille, say they are taking a temporary break as their disagreements with the Ghanaian FA (GFA) intensify. Andre was dropped from the 2013 Africa Cup of Nations after a disagreement over his reporting time while Jordan was simply overlooked. Both have hinted that these Nations Cup calls influenced their decision. Sons of Ghana legend Abedi 'Pele' Ayew, Andre, who is popularly known as 'Dede', and Jordan wrote separate letters to the GFA to inform the body of their resignations. "My decision to withdraw my services from the national team results from a number of issues or matters that have occurred quite recently, especially with regard to my relationship with the management team of the senior national team," said Andre. "These matters have so affected me emotionally and psychologically that I am unable presently to offer the best of my services to my dear nation." Meanwhile, Jordan says he is quitting so that he can play well at club level and "obtain the quality, experience and stature necessary for a call-up to play in the national team". Jordan made his Ghana debut three years ago but was controversially overlooked for this year's Nations Cup, despite being in fine form at club level. "In the position for which my services are required for the national team, I have been ranked way behind several players as not to merit a place in the team on occasions when it mattered," he claimed. "In this regard, I have decided that I need to work harder, especially in my club, in the hope that I can convince the management team in the very near future that my efforts merit a place in the national team - not just occasionally or sporadically, but more permanently," the striker added. The brothers have not put a timeline on their return but insist they will return as better players in future. "My decision is not novel," added Andre, who was crowned the BBC African Footballer of 2011. "Some of my colleagues who have previously taken such decisions have returned more strongly and with vigour to serve the nation." The Ayews are the latest high profile players to put a temporary hold on their international careers for Ghana in a disturbing trend. Real Madrid star Michael Essien has been on a temporary break from international duty for more than a year. AC Milan's Kevin-Prince Boateng quit entirely in 2011 while captain Asamoah Gyan took a break after the 2012 Nations Cup before returning as captain later that same year. The retirements cap a disappointing week for the GFA, after defender John Paintsil was involved in an incident with his wife on Friday - one which resulted in the player being arrested prior to his release on bail.